One of the things I was most excited about experiencing in New York City, was The High Line - an elevated park trail created out of an old railroad track that opened in 2009. 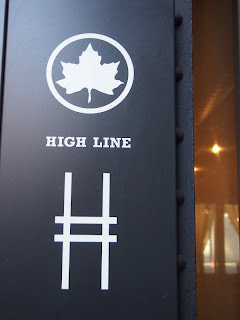 It did not disappoint and I would encourage you not to miss it on your next visit to NYC. A walk along The High Line with a piping hot coffee and the warm sun on my face is my idea of a great start to the day. 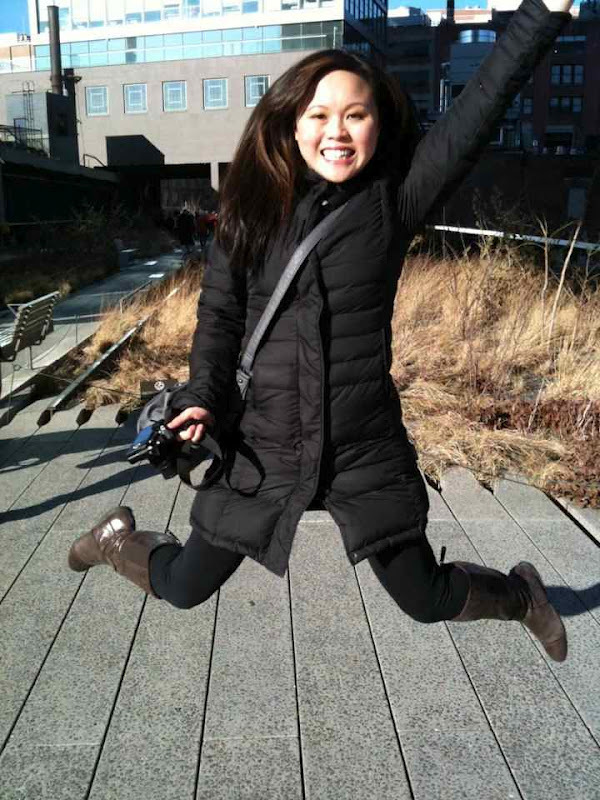 Jumping for joy because the sun has come it and its free Vitamin D! Street theatre. 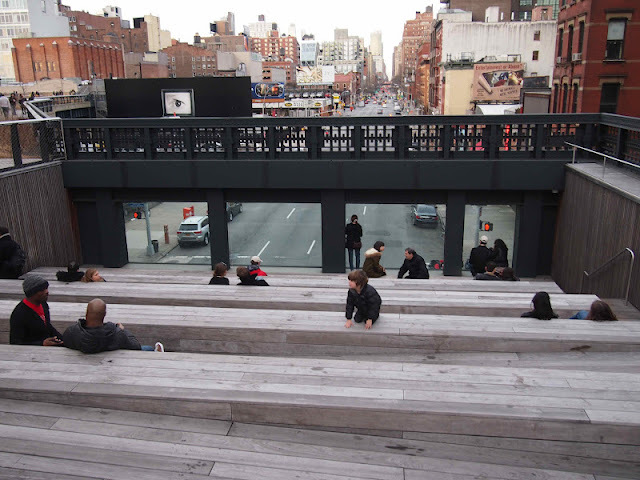 A place to sit and watch cars zoom by from an overhang built into the High Line. 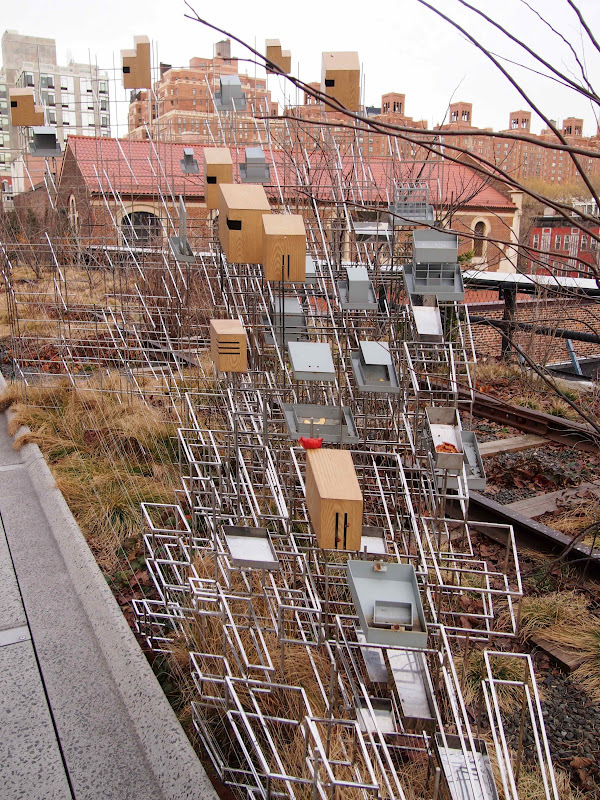 It's one of the many art installations you'll find throughout the park. 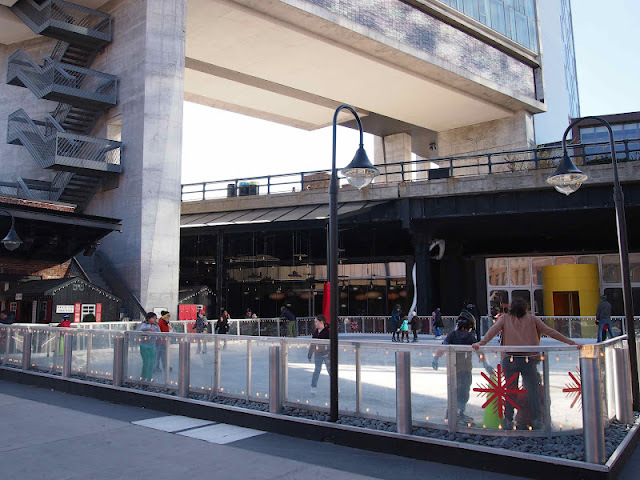 I'm a sucker for an outdoor skating rink and the one at the base of the park in front of The Standard Hotel is lovely and full of giggling children. I recommend grabbing the subway here and starting your 'urban hike' from this point. 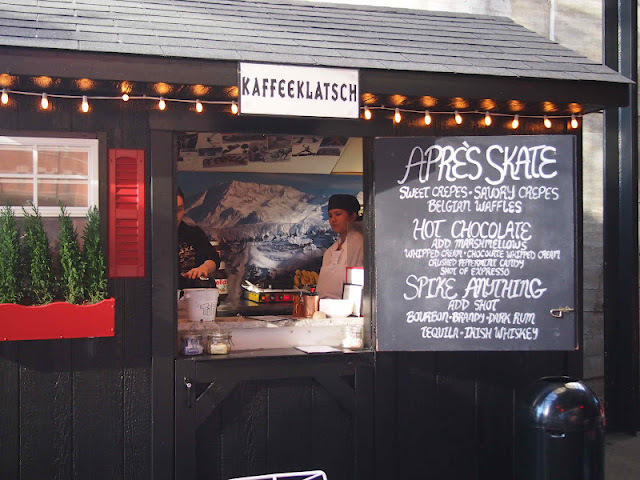 Before your walk, stop for a spiked coffee, hot chocolate or Belgian waffle to-go at this pop-up coffee hut, right next to the ice rink. You can stay warm and there are lots of public washrooms along the trail. The walk should take you around 30 minutes with stops before you get to the end of the line at 30th Street. 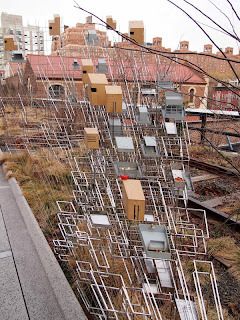 Mod birdhouses and interesting art installations line the path (above). 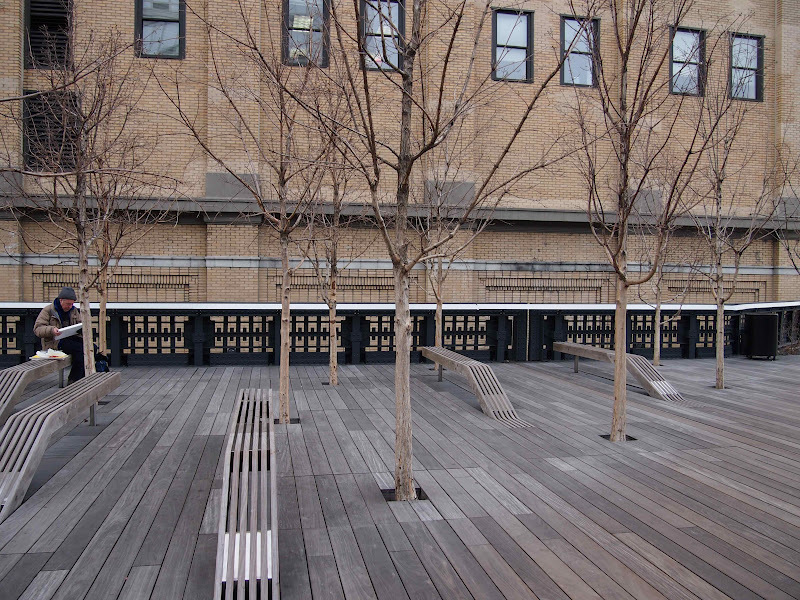 Make sure to listen for the audio installations, where a bench will start talking to you or the water fountain will begin to murmur. There's also music and quotes playing in the washrooms and elevators. Benches look like they rise out of the ground (above). 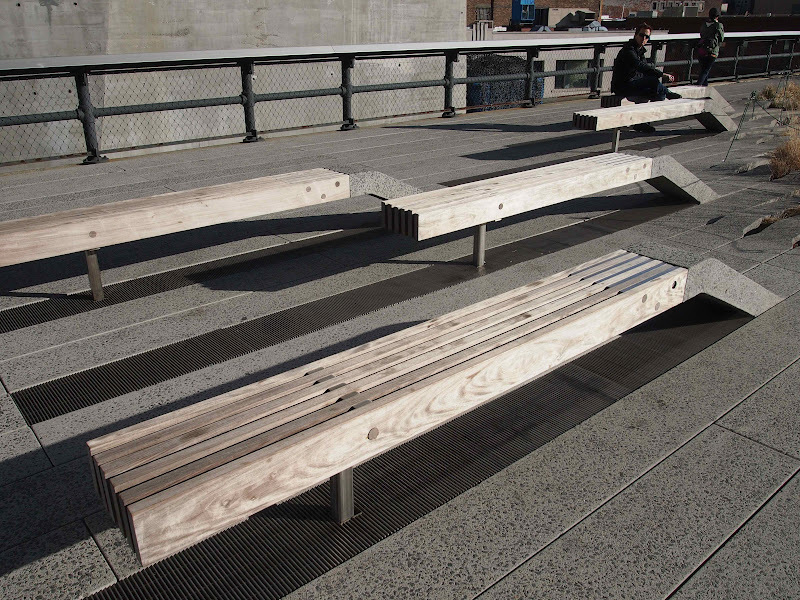 Keep an eye out for the west-facing curved wooden sun loungers next to Chelsea Market. It's the perfect place to catch some rays and read a book. Bistro chairs and tables are also scattered throughout The High Line. 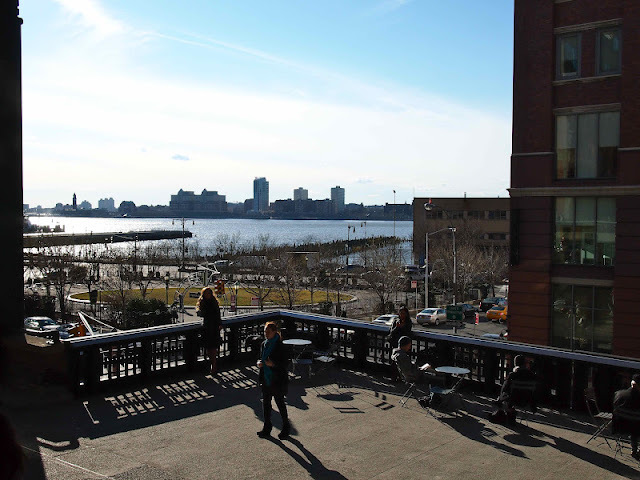 Stop and grab lunch at Chelsea Market and find an outdoor spot to dine al fresco with a view of the river. I would love to come back here and see all the plants in bloom and the greenery everywhere. Alas, it was still beautiful to be elevated, with traffic running all around underneath you - the park still feels peaceful. 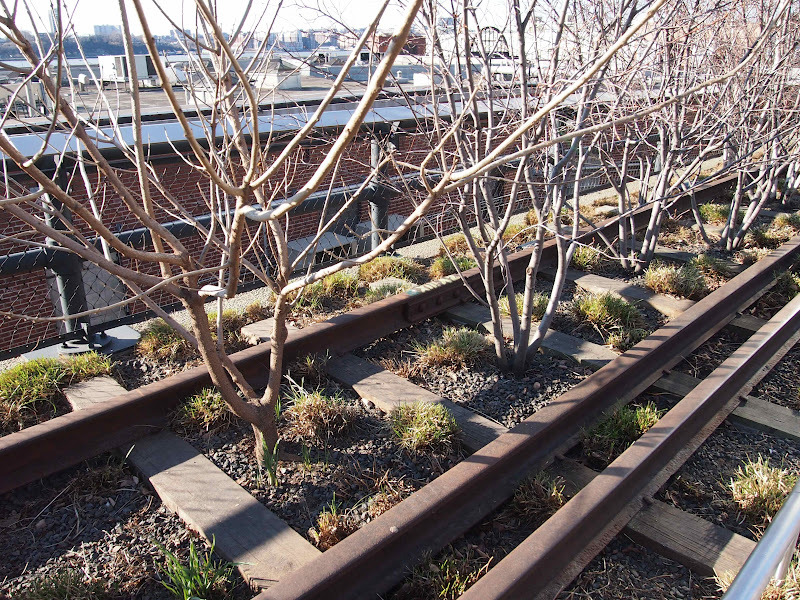 Some of the old railroad tracks have been repurposed and used in the landscaping (above). For more information visit: Friends of the High Line. You can print out a map and learn about all the art installations to look for along the way and read up a bit more on the history. Going to New York City? Read more from our NYC Travel Series!